For more than twenty years British artist Cornelia Parker has been building a rich and intellectually complex body of work. As an artist, Parker spends much of her time running errands and managing various aspects of production connected to her practice. Here she notices the marks, scraps of decay and detritus of the city, which to her appear as moments of poetry, and are usually overlooked by others. 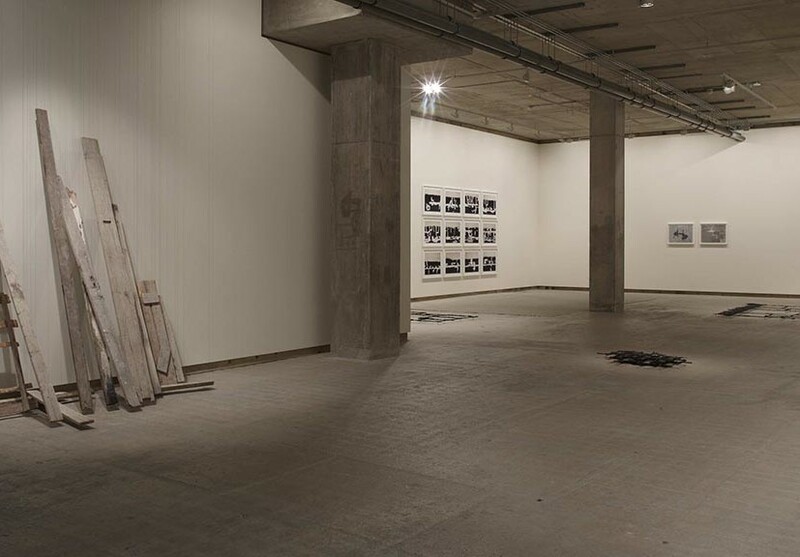 Her new exhibition at Frith Street Gallery deifies some of these moments; cracks, stains, repairs and discarded objects are made extraordinary, physical and precious. The gallery floor is populated by a number of pavement crack sculptures; cast in black bronze they look like petrified line drawings. The spaces between the paving stones in Bunhill Fields, a nonconformist burial ground in East London which Parker crosses whilst walking her daughter to school daily are lifted out, along with a puddle on a city street, reminding the viewer that this ordinarily unseen, grimy space has a discrete secret architecture. The latticed sculptures appear to hover just above the floor on steel pins, as is often repeated in her practice. Sculptures float, discarded scaffolding planks and parts of pallets – bleached out building materials – lean just off the wall held by wires, not quite at rest, their resonance and charge within the gallery space amplified. Also featured in the exhibition is a series of new photographs of the cracks Parker noticed in the prison walls of Pentonville, which look like abstract paintings. Parker photographed the marks moments before they were erased by a layer of magnolia paint, and the visible tide mark of the paint cutting across the top third of the photographs allows them to be read too as landscapes. An incredibly personal exhibition in which the viewer is asked to witness the transformation of the most ordinary objects into something compelling and extraordinary- well worth a visit. This exhibition coincides with Thames & Hudson’s publication of a major new monograph on Cornelia Parker by Iwona Blazwick with a foreword by Yoko Ono, introduction by Bruce Ferguson and commentaries by the artist. Price £35 hardback.